My husband was an American soldier. He raised his right hand and swore an oath to protect our country. At the time, we were young, A was little and couldn’t be on his insurance because she wasn’t his biological child. He had talked about joining the military for the entire length of time I had known him and he just went and did it. He joined, he left and I was pregnant with E taking care of 2.5 year old A.
I don’t know if my husband will ever be as proud of an accomplishment as he has been for serving in the US Military. No matter what scars he was left with (shrapnel in his foot that he has no memory of getting for one), he is proud to have served and respects his fellow brothers/sisters in arms. As hard as the aftermath is some days, I can’t say that we would do anything differently. His service defined our family and relationship dynamics for over seven years and still does to some degree today. 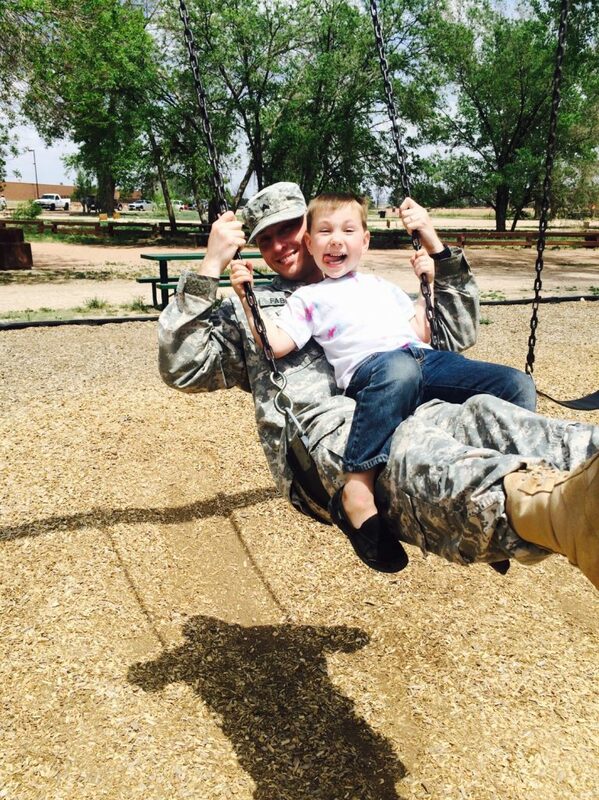 The military family is a lot like anyone else’s family. They come in all shapes, sizes, colors and religions. They love deeply, maybe a little more deeply than a regular family because they recognize that tomorrow really might not come… Or, it might come but Daddy or Mommy might not be here participating in it. Military Families do “Daddy kisses”. What are these? They are hershey kisses that signify each and every day that daddy will be away and the kids get a sweet kiss every night. It’s meant to be a little way to connect parents to kids and a fun countdown. Every spouse of a soldier will relate to the butterflies experienced when your loved one is away and you get an unexpected call. Everything is put on hold, your heart jumps into your chest and you savor every moment listening to them speak. Those conversations, even the three minute ones, are the most amazing in the world. And they always end too soon. R&R is like a vacation from reality, except your kids are still needing you and your two year old has no interest in your spouse approaching him. Seriously, though, all the feels because you just soak it all up. Even E standing on his changing table naked yelling for me because no one else should change his diaper. Church with little kids is often hard enough. Our first deployment, I didn’t cry until I was driving home. That night, Hubs called for the first time and asked if I missed him. Absolutely, especially while kneeling to pray with our children. I missed his string and quiet presence. The Flag has incredible meaning and we are on an intangible level connected to each service member and family. I was at a party this weekend and a few women I had never met before were there. One’s husband was recently deployed. I’m still thinking of her days later. It’s one thing to choose not to be with your spouse. It’s another to want them but have duty call. Here’s to the military child. These resilient kids have tangible fears that most don’t even think of. They work hard to make their parents proud and pick up the slack around the house!